It seemed like our Nile Cruise had got over so soon! 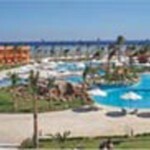 We left for Hurghada on Day 8 of our tour. Our vehicle was part of a convoy which sped us to Hurghada in about 4½ hours from Luxor. Hurghada is known for its azure clear water and white sand and is a diver’s delight with snorkelling opportunities galore! From Hurghada, there are excursions to Giftun Island or you can take the glass bottom boat to gaze at the deep sea corals. Hurghada was once a fishing village with crystal clear water and untouched reefs. There were quite a few shipwrecks near its coast in the earlier times. 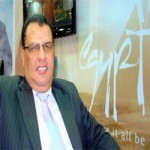 However, today it is one of the finest beach holiday destinations on the Red Sea. Lying 395 kilometres to the south of Suez, Hurghada has an ambient climate. 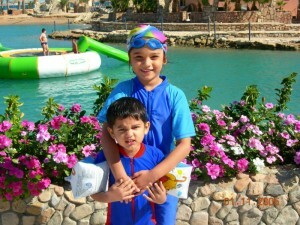 In November, it was extremely pleasant in the evening and we checked in at a plush luxury resort. The children were quite excited as at last they felt that they were “free from visiting temples”. However, their misfortune was that the water was a little too cold for their comfort. The resort had plenty of activities! You can ride quad bikes, camels or horses or just spend the entire day on the beach enjoying the sun, sand and the sea. We were scheduled to stay for 2 nights and on the day of our arrival we had a quick dinner before crashing upon our beds. The following morning, the children enjoyed themselves at the pool side for a while – swimming and using one of the many water slides. 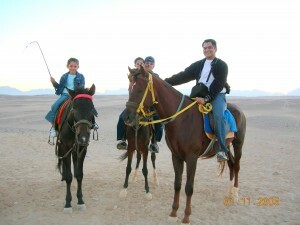 Later in the day, we went horse riding in the desert which was a very chilly experience as it was extremely cold in the middle of the desert. How the day flew by was very difficult to decipher – and it was already our last day at Hurghada! We took the Aquascope for a 3 hour tour. A coach picked us up and took us into the Red Sea. There, we boarded a submarine which took us to the middle of the sea to view the beauty that exists under water in the middle of Magawish Island! 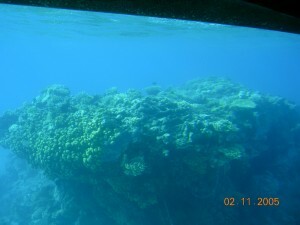 Through the transparent glass, we could see colourful fishes, coral reefs and the beauty of nature. I am sure if the water wasn’t as cold, we could probably have ventured out and done some snorkeling. Soon we were on our way back, in a flight back to Cairo later in the evening. We had come back to the place where our trip had started. 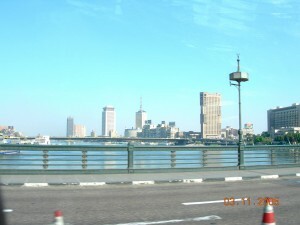 The next morning, we visited the modern part of Cairo which included a trip to the top of the Cairo tower. From the top, we got a bird’s eye view of the entire city including the river Nile! The Cairo Tower is 187 metres in height and has two storeys near the top. At the first level, there is a cafeteria and a restaurant whereas the second level provides one of the best views of the city and its suburbs. Thereafter we went to Khan el Khalili bazaar which is Egyptian’s oldest market and is in existence since the 14th Century. It is well known for its small ,cheesy souvenirs and you have to be very good in bargaining in order to get the best deals! Opposite the bazaar, there was a majestic mosque and alongside it was a Cathedral – as there are quite a few Coptic Christians in Cairo. There was a festive mood all around as it was Ramadan. We could see lot of locals feasting on stuffed pigeons at nearby restaurants. Stuffed pigeon dishes are popular, especially around the festive time. Later, we went to City Star Mall in the Heliopolis area where we saw an interesting variety of food at the food courts. Unfortunately, it was the first day of the festival of Ramadan and the food court was closed.Later in the evening, we walked down to the Mena Oberoi Hotel to try some Indian cuisine at the Moghul Room. We relished the Indian food which we were having for the first time on our tour. We had an early night as the following morning would be our last day in Egypt. 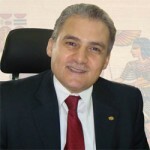 We were to visit the Pearl of the Mediterranean, the city of Alexandria.